Capitalism vs. the Climate joined with Hands off Appalachia on November 25th in a series of direct actions targeting mountaintop removal financier UBS in Stamford. 14 demonstrators were arrested. On Monday, December 2nd, the last of them were freed. This is not the first time that people in Appalachia and Connecticut joined together to protest the coal bosses. In 1988-90, Appalachians went on strike against Pittston coal and traveled to protest the company’s HQ in Greenwich, CT. That strike won crucial health care and retirement benefits for miners in Virginia. 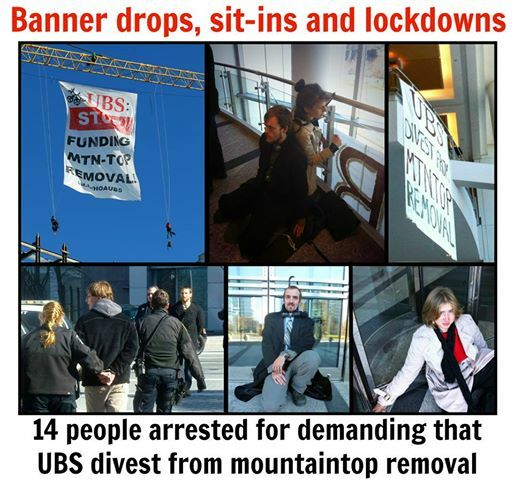 Now, we will win in making UBS divest from blowing up mountains. 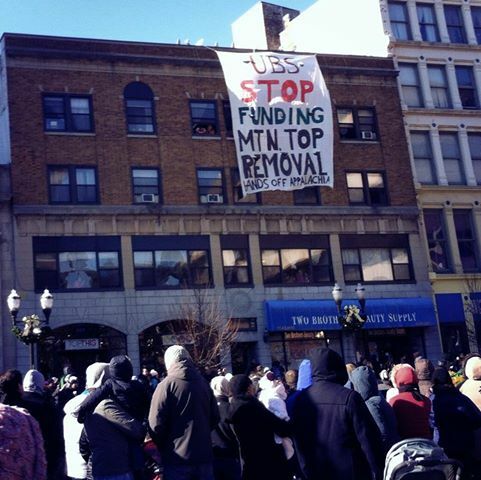 Also, on the 24th, Hands off Appalachia dropped a banner in the middle of UBS’ Thanksgiving parade in Stamford!